If you have a hard time finding the perfect pillow for your stomach sleeping style, then look no further. Flat pillows offer tremendous comfort and relief for stomach sleepers. There are a number of flat pillows to choose from, but you may not know where to start. I have compiled the top five flat pillows for stomach sleepers here in this guide. This guide will enable you to find the perfect pillow for your stomach sleeping. Say good night to your sleeping woes! Read on to find your perfect flat pillow for stomach sleepers. 1. Blue Wave Bedding Gel-Infused Pillow – Editor’s Choice! Overview: A totally flat pillow infused with cooling gel, this pillow is the coolest of them all. It boasts a totally flat and slim design and superior ventilation. It is 60% polyester and 40% rayon derived from bamboo, fully Certipur-certified. One side is flat and the other is rounded depending on your needs. Review: Sleeping on my tummy on this pillow was a dream. I used the flat side and found it very cushiony. It was extremely cool and I didn’t sweat at all despite the high heat outside. It was also just firm enough for me and supported my back and shoulders and neck with its firm flatness. 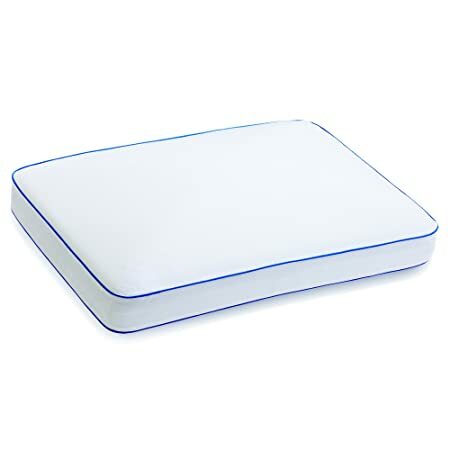 Overview: Flat as a pancake and stackable like pancakes too, this adjustable pillow has a size ideal for everyone. There are six layers of flat foam. There is also a 300-thread count cotton case that is fully washable. The microfiber fill is hypoallergenic and cool. Review: Two layers was perfect for me, but I had to add more over time because the foam went flat. The microfiber fill is soft and buoyant, supporting my neck perfectly. I loved that I could wash the cover and change the loft myself. The cotton cover is nothing special – it is not uncomfortable nor is it especially soft or cooling. Overall, I loved this pillow and woke up on my stomach with no pain every morning. Overview: An ultra thin pillow, the loft is only 2”. The memory foam gives well but the solid edges make the pillow hold its shape. There is a cooling technology installed in the memory foam. The gel memory foam relieves pressure, making it great for pain alleviation. Review: This pillow is a thin but plush one that feels lovely to sleep on. It stays cool in the hottest weather and protected me from allergies during one of my worst allergy months. Six months of use, and it never lost its shape. It comes with a bad odor that takes a long time to dissipate. I wished that I could wash it to get rid of the smell but that would have ruined the pillow. It did help with my neck pain and allowed easy breathing while I slept on my stomach. Overview: This pillow is ultra slim at only 2.5”. 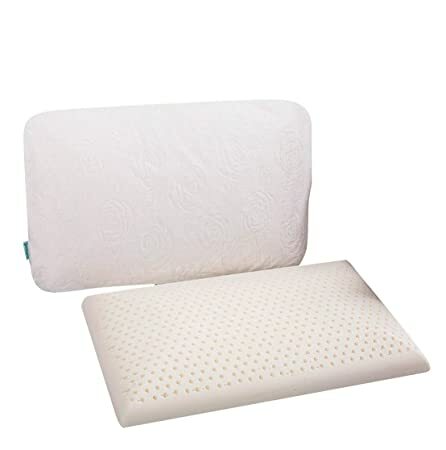 It is made of supportive memory foam with a washable cotton cover. One side is flat and the other is rounded like a normal pillow. It is hypoallergenic and resistant to microbes and bed bugs. Review: This pillow is very thing and I loved it for that reason. It does not bunch up and did not flatten over time. The cover is average and easy to wash. The foam is extremely soft, so it almost feels like nothing is there, which is what I wanted from a pillow. It may not be for everyone, though, as some people prefer firmer pillows. I was able to breathe easily and not feel suffocated while using this in a stomach sleeping position. Overview: A slim orthopedic option, this pillow is ideal for those with neck and back problems. It is only 2.7” in loft and made of natural latex. The pillow reacts to pressure and springs back to shape when the pressure is relieved. It has a removable inner and outer cover for easy cleaning. It is skin friendly, antimicrobial, and hypoallergenic. Review: The thinness of this pillow impressed me, especially when the latex contracted when I laid on it. I was worried it would be too thin but I slept easily on it. I woke up with no pain. The pillow makes it easy to breathe and the cover is soft and gentle on the skin. It is a little hot, but not too much. I didn’t suffer from any pain or allergies while using it. The covers are easy to remove and wash.
Memory foam is the most comfortable and contouring. But it gets hot. You need cooling technology and airflow if you are going to use a memory foam pillow. Cotton, down, and other materials tend to go flatter with time. They lose all loft. You should opt for a never-flat technology, an adjustable design so you can add more fill, or be prepared to buy a new pillow every few months. 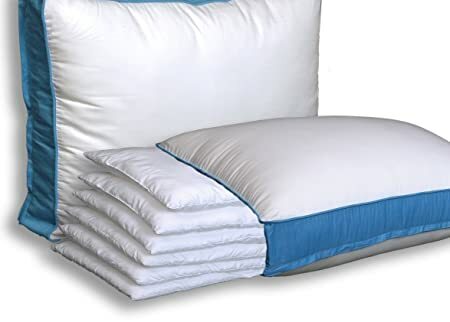 Most of these pillows will lose their shape or become ruined if washed. Elect washable covers and spot clean the pillows if they get too dirty. Hypoallergenic material protects you from dust mites that cause allergies, as well as trapped dust, spores, and pollen. These are a must for allergy sufferers, asthmatics, or people undergoing breathing treatment. Cheaper is not always better. You deserve good sleep, so opt for quality over cheap price. Reviews are your best friend in determining the quality of online products. 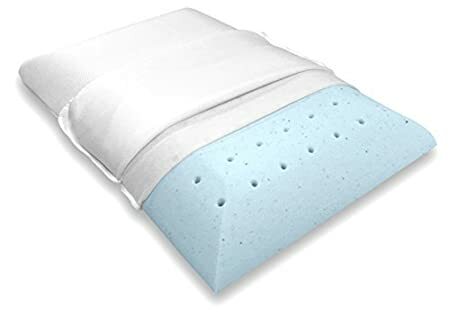 If you are a stomach sleeper or have bad neck and back pain, flat pillows for stomach sleepers can provide the ultimate in comfort and support. These pillows won’t throw your spine out of alignment by elevating your neck too high. Get on Amazon now and pick out your brand new pillow for a better night’s sleep!